An expert has commented that the latest deadline for the extension of the US EB5 visa will expire on September 30. 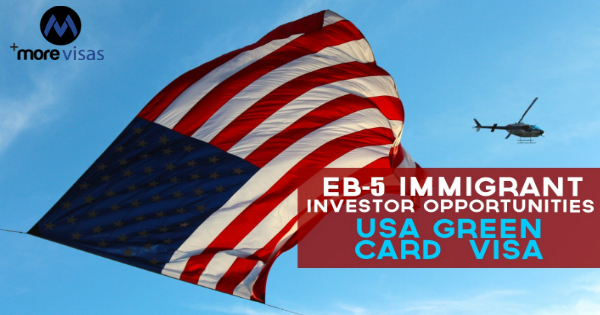 US EB5 visa permits overseas nationals to seek a green card by investing in the US, It is expected that the investment limits, necessary under the scheme, will be increased by the authorities. The Office of Management and Budget has released its Spring 2018 Agenda. This informs all the stake holders and the public regarding the US administration regulations which it will enact or consider in the future. It seeks, to boost the EB5 investment limit from $500,000 to $1.35 million and a final action in this matter is likely to happen by August 2018. Thus the $500,000 limit will go up to $1.35 million and the $1 million limit will also increase to $1.8 million. EB5 visa program started in 1990. It permits a person to invest $500,000 in a Targeted Employment Area, which experiences a high rate of unemployment. They can also invest in a rural area outside of metro limit, or $1 million in a non-TEA area, which can create 10 or more jobs. This path leads the investor to obtain US Citizenship. President Trump wants to implement a policy by using strict norms to issue H1-B visas, which is very popular with the Indian IT firms. The EB 5 visa has a great demand because it offers a very short route to citizenship. Additionally it does not have a long waiting period. A private member wants to seek legislation to increase the minimum salary of H1-B visa holders to $130,000. Presently, the minimum salary is $60,000. Furthermore, the US administration has also announced the discontinuing of processing of premium H-1B visa petitions for the fiscal year 2019, which commences on October 1, 2018. Moreover, the USCIS review all petitions seeking H1-B with more scrutiny. Simultaneously, the EB5 visa program has also become controversial, as some critics, believe that it is similar, to selling US Citizenship. Authorization for the EB5 program is purely temporary since September 2015. Annually around 10,000 EB5 visas are issued and there is a limit cap of 700 for each country. The approval rate of applicants from India is 64 percent which is comparatively low than other countries. Some Indians take the direct investment route without opting for a regional center which works on the investments, and also monitors the job creation. The EB5 program specifically needs white money only. What Indians need to do? Indians, who are planning to apply for this visa, must do so before August 2018, in order to avoid the revised and increased investment limit. Moreover, there are alternatives and Indian applicants can also migrate in the Unconditional Investor Entrepreneur Programs for a lesser amount to other countries. Globally, there are several opportunities to migrate by using the investments. Moreover, some of them are more attractive than the EB-5 on the factors of cost, risk factors and processing time. Canada is a case in the point. Investors in the Investor Immigration Programs can get an unconditional residential status for self and dependents. They can make the investment after the Quebec government issues a clarification regarding the application. Another option is Bulgaria as it serves as a gateway to the European economy. Bulgaria has a Citizenship by Investment Program, which helps a person to get the residency within six to nine months. Also, there is an easy option for citizenship in 18 -24 months. The Bulgarian citizen has a right to live, study and work in any of the 27 EU countries. There are bilateral agreements with the EU and Switzerland and Norway. Britain offers two Tier-1 visas called the Entrepreneur Visa and Investor Visa, which are very modern, promising and easy to understand. Additionally, the risk factor is less in them. An investor can obtain a UK visa in eight to sixteen weeks, leading to permanent residency status after five years. Finally, it is a fact that the EB-5 needs many years to be fruitful.